These 1-day contacts are enhanced with Lacreon technology for added moisture and UV filters to protect against sun damage. This package contains 30 lenses. 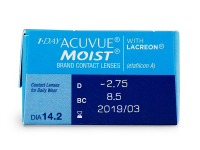 1 Day Acuvue Moist are daily contact lenses developed by Johnson & Johnson as the successor to the original 1 Day Acuvue lenses. 1 Day Acuvue Moist lenses are produced with the exclusive Lacreon™ technology, which embeds a lubricating substance directly into the lenses. 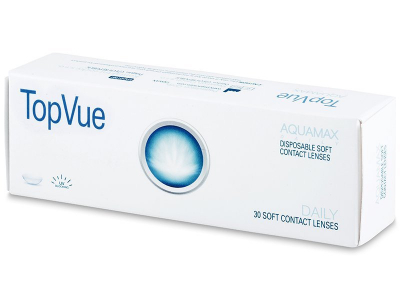 The manufacturer states that the transition from 1 Day Acuvue to Acuvue 1 Day Moist is possible without the need for a consultation with your optician. This package contains 30 lenses. You can also choose a larger package of 1 Day Acuvue Moist 90 lenses at a great price. Lacreon™ production technology embeds a moisture-rich wetting agent directly into the lens. This moisturising component is similar in composition to natural human tears, and it helps reduce friction between the lens and the eyelid for exceptional comfort of wear. 1 Day Acuvue Moist contact lenses are equipped with UV filters to protect against harmful UVA and UVB rays. The lenses also have an inside-out mark, which makes handling and inserting lenses easy. Really comfortable and clear. My eyes don’t dry out wearing these lenses. Super convenient lenses, changed recently to dailies for convenience and these lenses are perfect. Hi there do you have the 1 day acuvue moist 90 pack? I don't see the option to choose here. Thanks! Hi. 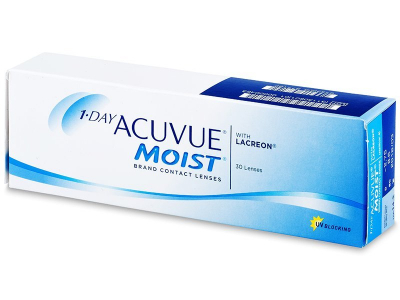 DO you have 1 day acuvue moist colors? Having trouble finding a reputable daily colored lens. Any advice? 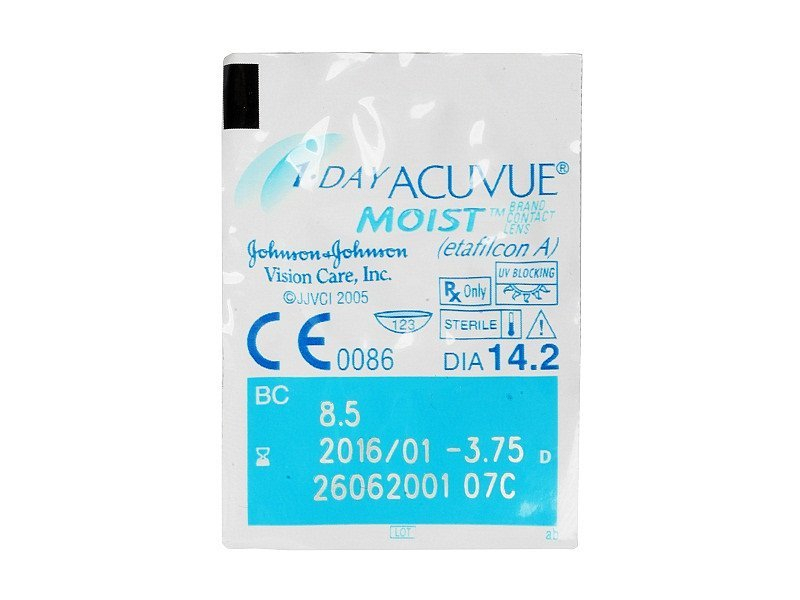 Do acuvue one day moist material contain silicone hydrogel? I find the lenses to be more comfortable than before, and I read that this material is excellent. Please advise. Great feeling. Big improvement over the previous 1 day acuvue.